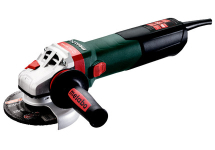 More and more companies from metal trade and industry rely on Metabo angle grinders. The powerful machines with overload capacity have become vital in every day work. 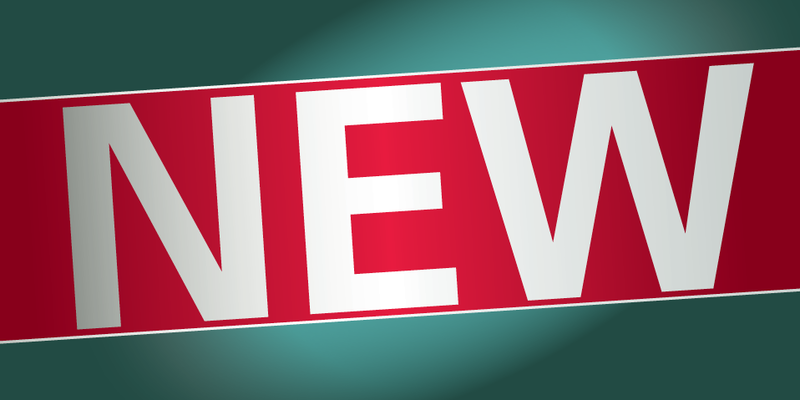 When cutting or roughening metal they do a good job, in connection with diamond cutting discs even stone and concrete can be cut. Metabo angle grinders are available for all disc diameters in varied versions for mains operation with a rated input power of 750 to 2,600 watt. 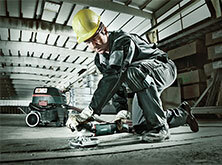 Alternatively, Metabo has many powerful cordless angle grinder up to a disc diameter of 230 mm in its programme range. 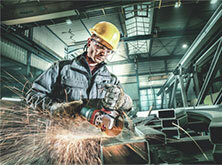 For companies working with compressed air, there are two air angle grinder for 125 mm discs. Entry criterion for angle grinders is the disc diameter. Discover your Metabo angle grinders Ø100-150 mm in the range up to 150 mm or angle grinders Ø180-230 mm in the range of 180 to 230 mm disc diameter. All models are equipped with guard, clamping set and side handle. If if gets tight for others, the flat-head angle grinders gets only started. The specialist with the particularly gear head can grind down to narrow angles of 39° ((at 150 mm diameter). Therefore it is ideal for removing rust, lacquer or welding sludge in narrow frame constructions and when working in confined spaces. 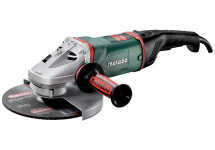 There are flat-head angle grinder both with cable and also as cordless for operation independently from the power grid. Some angle grinders are developed especially for processing stainless steel. A thigh torque and a reduced speed range adapted to stainless steel ensure cool grinding without blue discolouration. These specialist carry the word Inox in their names and are available in different versions, also as flat-head angle grinders Inox. integrated and thus offer the best possible user safety. 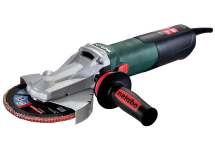 Metabo has an extensive range of cutting and grinding discs for any application area. Depending on the requirement, there are several quality classes in all relevant diameters: from basic quality with good cutting and material removal to premium quality with very high cutting performance and maximum tool life. For cutting concrete and stone, the Metabo diamond cutting discs are used. Even here there are quality classes for all requirements in all relevant diameters. Further cutting and grinding accessories such as cup wheels, flap discs, fibre dics and cleaning fleeces as well as steel-wire brushes for cleaning, deburring and rust removal as well as special accessories for processing stainless steel can be found in the Metabo range of accessories for angle grinders.